The Amer Fort, also called Amer Palace or Amber Fort, is a majestic fort located in Amer in the outskirt of Jaipur, Rajasthan. Located at the distance of 11 kilometers, Amer is a town with an area of approx. 4 square kilometers. The town was built originally by Meenas, and later it was ruled by Raja Man Singh. Situated atop a hill, the Amber Fort is one of the principal tourist attractions in Jaipur city area. The fort is known for its stunning architecture incorporating artistic Hindu style elements. With its large ramparts and series of huge gates and cobbled paths, the fort overlooks wonderful view of Maota Lake, and Jaipur city. Maota Lake is the main source of water for the Amber Fort and Palace. The fort complex is constructed in red sandstone and marble. It is laid out on four levels. Each level has a courtyard. The complex also consists of many stunning structures like Diwan-i-Aam (the Hall of Public Audience), Diwan-i-Khas (the Hall of Private Audience), Jai Mandir, Sukh Niwas, and Sheesh Mahal (the Mirror Palace). The Amer Fort is also known as the Amer Palace. The attractive, opulent palace was the royal residence of the Rajput Maharajas with their family members. Immediately above the Amber Fort Palace, the Jaigarh Fort is located on the Cheel ka Teela (Hill of Eagles) of the same Aravalli range of hills. The Amer Palace and the Jaigarh Fort are considered one complex because they are connected by an underground concealed passage. This subterranean passage connecting the two forts were constructed as an escape route in time of wars to enable the royal family members and others in the Amer Fort Palace to shift to more formidable Jaigarh Fort. 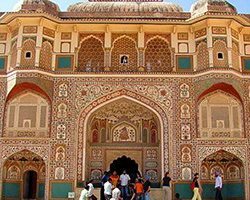 Ganesh Pol Entrance, Sila Devi Temple, Jalebi Chowk, Garden, Magic Flower, Tripolia Gate, Lion Gate, Zenana, Jas Mandir, etc are some of prominent attractions to see within the Amber Fort Palace complex. The magnificent Amber Fort Palace was declared as UNESCO World Heritage Site in 2013 as a part of the group Hill Forts of Rajasthan. Other forts in this group are: Kumbhalgarh Fort, Ranthambore Fort, Chittorgarh Fort, Gagron Fort, and Jaisalmer Golden Fort or Sonar Quila. One of the best and most popular ways to access the hilltop located Amber Fort Palace is an elephant ride. Elephant ride to the fort is available from morning 7:30 till afternoon 12:30. You can also enjoy here light and sound show which starts from 7:30 in the evening. Watching the illuminated Amer Fort Palace from the bottom of the hill in the evening would be a mind-blowing experience. From the ramparts of the fort you can see panoramic view of the entire Jaipur city. You can also enjoy classical dance show in the evening at Sukh Mahal in the fort complex. There is also a restaurant within the fort complex which serves various Rajasthani and North Indian cuisines. There is a turban museum in the fort where you can see a large collection of colorful Rajasthani turbans. On the whole, exploring Amber Fort Palace will provide you a complete tourism experience to cherish for lifetime.